Nice and simple, but like many nice and simple things, only a half truth. And of course a half truth misrepresents the other half of the truth. 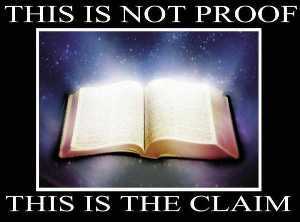 For the Bible is both evidence and a claim. The Bible consists of many documents. Historians have examined those documents and come to conclusions, some of which are fairly much agreed upon. They find some parts to be probably historically inaccurate, and other parts to be probably historically accurate – and that means just as accurate as other ancient history. Thus the Bible contains good historical evidence – not all of it, but sufficient parts of it to be useful. And that means it is evidence. Then of course it also becomes a claim. But a claim based on the historical evidence, not on nothing. Sceptics often accuse christians of having faith without evidence, and I suppose this must sometimes be true. (Though since christian faith is based on Jesus and the gospels, and these is good historical evidence for the basic facts outlined in the gospels – see Jesus in history – this charge will not generally be absolutely true.) But I am clearly seeing “faith-based” behaviour on the part of some atheists, especially young ones on the internet, who bely their professed rationalism by ignoring the facts established by experts (e.g. about Jesus) and by misrepresenting christian belief (e.g. about faith). How we can know something is true, including belief in God, in Truth, proof and certainty. Are the sceptics right about faith, in Is faith the opposite of reason? The sceptics say it’s so, but Is there no evidence for God?